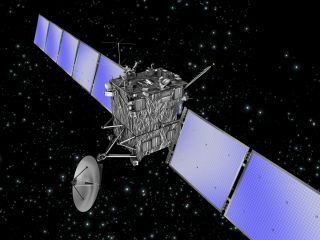 An artist's illustration of the European Space Agency's comet-chasing Rosetta spacecraft. Rosetta will explore Comet 67-P/Churyumov-Gerasimenko when it arrives at the object in August 2014. Europe's comet-chasing space probe Rosetta has been hibernating for more than two years, but in January, the spacecraft will be jolted awake to prepare for the climax of its mission. Scientists hope the comet images and data collected by the $1.4 billion Rosetta probe will help them piece together the early history of our solar system since comets are among the most primitive objects in our cosmic neighborhood. By searching for organic molecules on the comet's surface, Rosetta also could help scientists examine the possibility that space rocks planted the seeds of life on Earth, researchers said. The 6,600-pound (3,000 kg) spacecraft was put in a deep sleep in July 2011 for the final and longest leg of its journey. During its hibernation, Rosetta was tilted so that its solar wings faced the sun to receive as much sunlight as possible, according to the European Space Agency (ESA). Now mission officials are counting down to the spacecraft's wakeup call, scheduled for 1000 GMT, Jan. 20, 2014. "We are very excited to have this important milestone in sight, but we will be anxious to assess the health of the spacecraft after Rosetta has spent nearly 10 years in space," Fred Jansen, ESA's Rosetta mission manager, said in a statement. An artist's illustration of Rosetta's Philae lander on the surface of Comet 67P/Churyumov-Gerasimenko. Once awake, the probe will still have another 5.5 million mles (9 million km) to travel before it reaches its comet destination, according to ESA. Mission managers will use that time to activate Rosetta's instruments and perform a series of health checks. In late May, at less than 1.2 million miles (2 million km) from its target, Rosetta is due to execute a major maneuver to prepare for its rendezvous with 67P/Churyumov–Gerasimenko. From that relatively short distance, the probe will also start snapping more detailed images of the comet to glean better information on its topography, rotation speed and orientation. Then, in August, Rosetta will arrive at the comet. Then in November 2014, it will deploy a lander named Philae to take an up-close look at the icy body, which measures about 2.4 miles (4 kilometers) across. In its decade in space, Rosetta has already provided scientists with an up-close view of asteroids. It flew by a space rock named Steins in September 2008 and snapped close-up photos of the asteroid Lutetia in during a July 2010 flyby.